The moment young Ned Stark heard Bran call out to him across time it was clear Game of Thrones was messing with supernatural forces that might see the series dip its toes into the lake of yet another genre. The moment was unsettling enough with the cries of Lynna Stark emanating from the Tower of Joy, and it was made all the more so given the implications of what (or who, really) Ned would soon discover once he made his way inside. But for Bran to have reached out and connected with a person in the past, to demonstrate his vision quests aided by Three-Eyed Raven are more than watching history play itself out over and over again like a recording, to learn his participation in them is not passive, well, that had some enormous implications. And as Game of Thrones has demonstrated throughout these first episodes of season 6: the wait to find out what those implications are won't be a long one. 'The Door' presents an interesting challenge for the series moving forward, and not just one that has to do with Bran influencing events in the past and all the potential troubles that could be (or already have been) stirred up as a result of his being in one character or another's timeline. As the episode made clear with the reveal of what "Hodor" meant in a profound and sad way, Bran's reach across time can have severe, specific repercussions that loop around and impact his story without his necessarily being aware what he's doing. But as Bran's unsupervised trip through the Weirwood system reveals, the visions that send him across the Seven Kingdoms both past and present are a two-way street: he can reach out and touch someone, but he can also be touched. This is the most of the Night's King that's been seen since he and Jon exchanged long, meaningful glances in 'Hardhome.' Although he remains mute, there's a level of decisiveness in his actions that not only serve to make a tense action sequence look as impressive as anything the show has done yet, but also suggests winter is more or less here. It's hard not to notice the speed with which the Night's King showed up on Three-Eyed Raven's doorstep after grabbing hold of Bran in his vision. A few seasons ago, several episodes might have passed before Bran would need to start looking for a backdoor to the tree house he's been hanging around in since late in season 4. The speed with which things are unfolding is as exciting as it is unsettling. Game of Thrones has seen a number of major characters die in the first five episodes of the season, and Hodor's demise – along with yet another Direwolf – in addition to the death of Three-Eyed Raven, are added the ranks or Roose Bolton, Balon Greyjoy, and Osha. While Osha's death was yet another example of how much Ramsay has begun to be a drag on the season, as his presence is at this point all but a guarantee someone sharing the room with him is going to die, the other two are necessary plot machinations, setting up the eventual conflict that may well decide the fate of Winterfell and the north, while also giving Pyke its first major storyline since the series began. But Euron Greyjoy's successful play for the Salt Throne is like Bran's visions across time: it has larger implications than where the character happens to be standing at the moment. When Three-Eyed Raven told his student it was time for the young Stark to become him the timing suggested Bran would have to do so without the benefit of the same Weirwood tree. Similarly, Euron's play for the throne and move to usurp Yara's claim rested on the promise of something more, something much larger than Pyke and the usual ways of the ironborn. Euron was going to offer his (at this point hypothetical) naval fleet to the Mother of Dragons in order to put the Iron Islands on the map in a way they never have been before. Euron's plan is part of the consolidation of character threads that's been going on in Game of Thrones for the last few seasons. He's a new character, but Euron's motives and his actions are indicative of the sweeping change that's only just now begun to be seen with any great regularity on the show. Daenery's act of liberation last week was perhaps the most powerful statement that's been made so far, but it's clear there's a tectonic shift going on in the power structures of the Seven Kingdoms, one that promises new leaders who aren't afraid to take action. This has been demonstrated time and again as young upstarts routinely take what they want – in the case of Euron, literally tossing the old regime out like garbage – while the old power was mired in bureaucratic bickering and stalemates. But as 'The Door' made clear with Bran's tragic intrusion into Hodor's past and his discovery that the Children of the Forest created the White Walkers as a means to stopping the invasion of men, the past is never as done with you as you may be with it. While "hold the door" became a sad reminder of that fact, the power of the past permeated every thread throughout the episode, including Arya watching a theatrical retelling of her father's death. As has been the case with Arya's story for a while now, her questioning why the actress she's tasked with killing has to be killed calls into question whether or not she truly is No One, or if A Girl is somehow more Arya Stark than even she knows. The past also managed to show new sides to familiar characters. 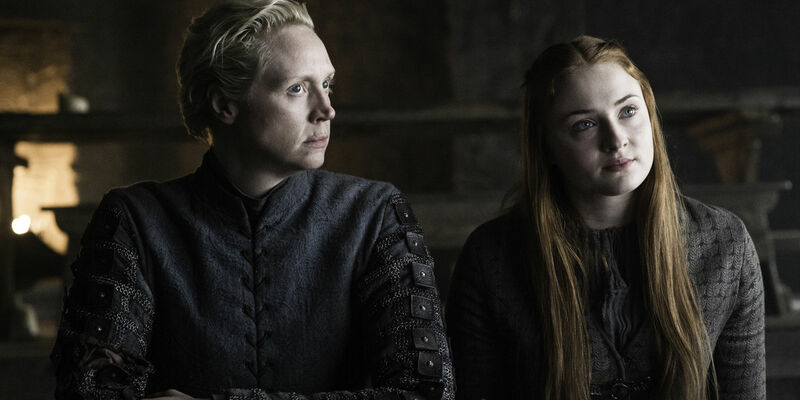 Sansa's confrontation with Littlefinger helped assuage some of the criticism from last season in the wake of the violent sexual abuse she suffered at the hands of Ramsay and how the show erred by treating her suffering as part of Theon's evolution. Here, though, Sansa demonstrates herself to be on a new path, one that sees her playing the game several moves down the line, and perhaps even questioning whether or not she can trust someone as important to her as Jon. Even Varys was made to recall the past and how without being mutilated, he might not be in Meereen, helping to shape the future of Meereen. The reminder was perhaps as powerful as the insight displayed by the Red Priestess. And while Kinvara's demonstration was impressive, it pales in comparison to the power the past still has on so many characters in Game of Thrones. 'The Door' found success in this past-centric hour, but it proved that the future is coming, and no one is strong enough to hold the door shut on it for much longer.